The above info came from Elwin Blaine Coldiron, and was edited by yours truly (contact me). The image came from Tenchi Zone. 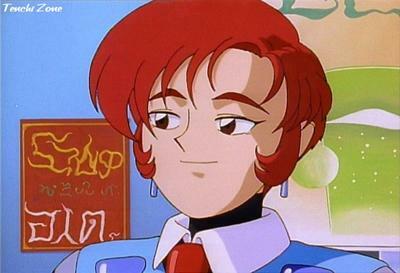 Mitsuki was one of Kiyone Makibi's classmates in the G.P. Academy, graduating below Kiyone. Mitsuki had always been jealous of Kiyone's success, and schemed continually to get ahead. Luckily for her, Kiyone was also partnered with Mihoshi, and the blonde's constant bungling had kept Kiyone from advancing to far ahead of Mitsuki. But when Kiyone got assigned to Earth along with Mihoshi, Mitsuki finally got a chance to shine. She easily gotten an assignment to Special Investigations, a very plumb posting. When Kiyone returned to G.P.H.Q. after the Masaki clan got branded as traitors by the Juraian emperor Kagato, she got assigned to one of the minor offices. Later however, when Kiyone got implicated in the Masaki affair (no thanks to Mihoshi blundering into a meeting with a G.P. official and a Jurai Intelligence officer), it was Mitsuki who had led a team to arrest Kiyone. However, Mihoshi had used their spaceship Yagami to rescue her partner and escape. They later joined the Masaki clan in their quest to clear their names. 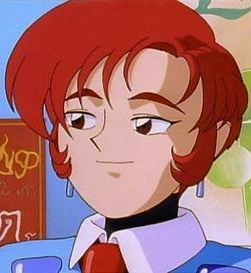 After the whole thing was over, Mitsuki got demoted (thanks to a little lobbying from Kiyone) and got posted as an aide to Kiyone and Mihoshi, as they got promoted to Special Investigations (they later returned to Earth). But mostly, Mitsuki just served the two tea, a very humiliating duty.